frankford adds my artrack to their avenue! 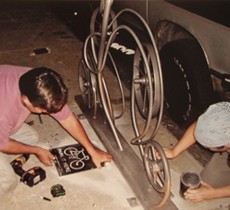 The “Growing” bike rack was the first rack I created for NKCDC (New Kensington Community Development Corporation) as part of their ongoing effort to create links between local artists and revitalization efforts. 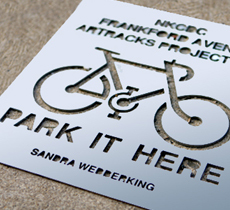 The “Frankford Avenue Artsrack Project” is an economic development initiative to promote biking, local artists and local businesses. 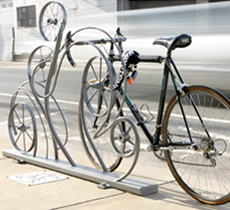 Part beautification, part economic development, these functional pieces of public art add to the Frankford Avenue Arts Corridor experience. “Growing” incorporates 2 recycled wheels and scrap metal pieces. 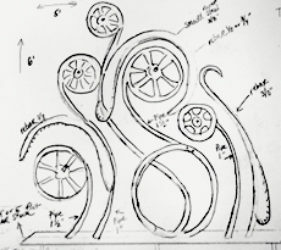 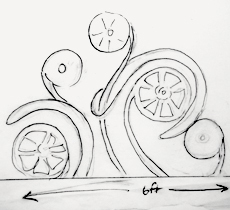 A variety of pipe, construction rod (rebar) and other bar stock steel are incorporated as the structure of the wheel sculpture. 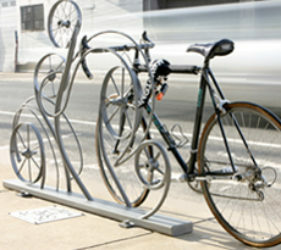 The finished piece installed on Frankford Avenue in Kensington, Philadelphia. The final sketch. After concerns about kids climbing on the rack, the design was altered to be more compact. 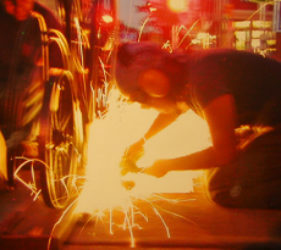 Cutting off the bolts to prevent theft.